Radish facts, an information sheet for kids cooking activities. Radish facts and general information about radishes. 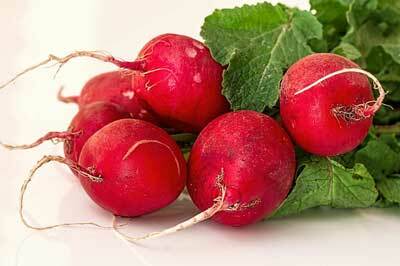 Radishes grow underground as a root vegetable. Once planted, they grow quickly. Watch the fun video below. Buy radishes that are firm with crisp leaves. Avoid radishes that are soft. Store in fridge and use within a few days. Use in salads or garnishes. Radishes contain Vitamin B6, riboflavin, Vitamin C and Vitamin K. They are also a good source of folate, calcium, potassium and fiber. Spread cream cheese on top of French bread slices. Top with radish slices. You can sprinkle with salt and pepper if desired. 2. Boil the pasta for as long as it says on the package (it depends what pasta you have)and then put it in the salad bowl. 4. Put in 2 spoonfuls of salad cream or mayonnaise and mix again. 5. Drizzle with olive oil and ENJOY!!!! Back to Food Facts from Radish Facts.